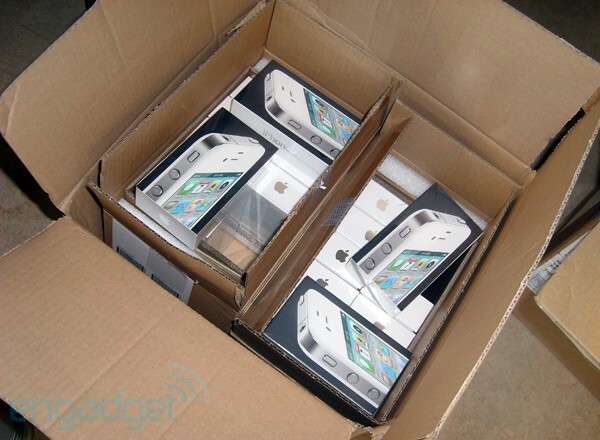 While the white iPhone 4 hasn’t been officially launched yet, retailers across the country are already receiving their first shipments. According to engadget, and while Apple asked retailers to keep the devices hidden for now, one brave Belgium-based store has already taken a slew of pictures of the phone, expected to go on sale tomorrow. Last month, Apple Senior Vice President of Marketing Phil Schiller confirmed via his Twitter account that the white iPhone 4 would be finally available this Spring, and despite countless delays, the device is finally about to launch. While the phone shown on the pictures is an AT&T-compatible iPhone 4, a Verizon-compatible version is also expected to be available tomorrow – note that at this stage, nobody knows at what time the device will actually be available for purchase. The white iPhone 4 has been a bag of hurt for Apple, long before the black iPhone 4 actually launched. Apple was supposed to release both black and white models simultaneously back in June 2010, but the white version proved to be more challenging to put together than expected, prompting Apple to delay the release of the phone several times.